Content by Tony Macklin. Originally published on January 19, 2019 @ tonymacklin.net. 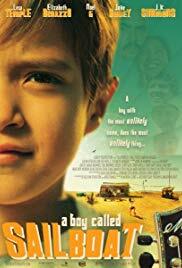 A Boy Called Sailboat is an odd and unique film. One has to suspend his disbelief, but it delivers more often than not. It is a film divided into various skits, but the skits share the element of absurdity. If you can accept the image of a leaning house propped up by a stick in the southwest desert, you're well onto getting on its wavelength. A Boy Called Sailboat is a religious allegory. A Mexican boy (Julian Atocani Sanchez), with a little guitar, is the savior. Communion wafers are spicy meatballs. A song is gospel. The boy writes the song for his seriously-ill grandmother, and each time he plays it on his guitar for others, he is met with reactions of rapture. The song inspires tears, overwhelms listeners, and effects humanity. Director/writer Cameron Nugent makes a canny decision. He never lets us hear the song. When the boy plays it, the soundtrack goes silent or there's a dissonant sound like the one that used to accompany test patterns. There are two things that lift A Boy Called Sailboat. The first is the natural performance of Julian Atocani Sanchez as the boy. He is a very likable actor, and is engagingly innocent. Nugent gives the boy narration that is credible. The second major asset is the terrific instrumental score - from Wittington Fair/Scarborough Fair to House of the Rising Sun. It adds a compelling lyrical beauty. Two recognizable actors appear in A Boy Called Sailboat. J.K. Simmons adds class and crudity as a salesman, and Jake Busey, aptly, overacts as an aggressive teacher, who undergoes transformation. In welcome contrast, Lew Temple renders a quiet, affecting performance as a DJ on the road. Also, giving softening performances are Noel Gugliemi and Elizabeth De Razzo as Paoli's burdened but gentle parents. The direction by Nugent is capable. There are occasional lapses - such as in a classroom when a girl looks at the camera. But in general Nugent avoids potential pitfalls. The credits at the end are accompanied by an instrumental version of "Row, Row, Row Your Boat." An unsung line from that song is "Life is but a dream." A Boy Called Sailboat is a vision.